All in the Next Year! My name is David Baumann, Lead Media Analyst at The Oxford Club. And today, with the help of investing legend and four-time best-selling author Alexander Green, I’m going to show you how to do something incredible. And use it to double the entire thing... in less than a year. You’ll have the chance to take just $5,000 of it... and double your entire portfolio to $200,000. But I’ve seen enough success stories from Alex’s subscribers across all of his services to know he can help you do it. 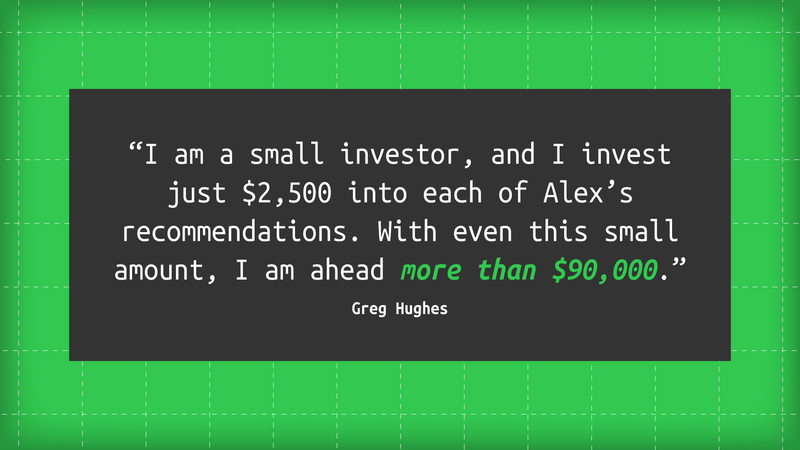 We’ve got hundreds of success stories like these... all possible because of Alex’s unique approach to the markets. You see, over the last five years... he’s perfected a powerful investment system based around a unique and controversial investment strategy. It directly contradicts the advice of the talking heads in the mainstream media. And yet the results are unlike anything any financial advisor or other strategy can produce. In fact, the prestigious research group Ibbotson Associates found that between 1927 and 2005, $100 invested using a large cap growth strategy would’ve become $88,400. 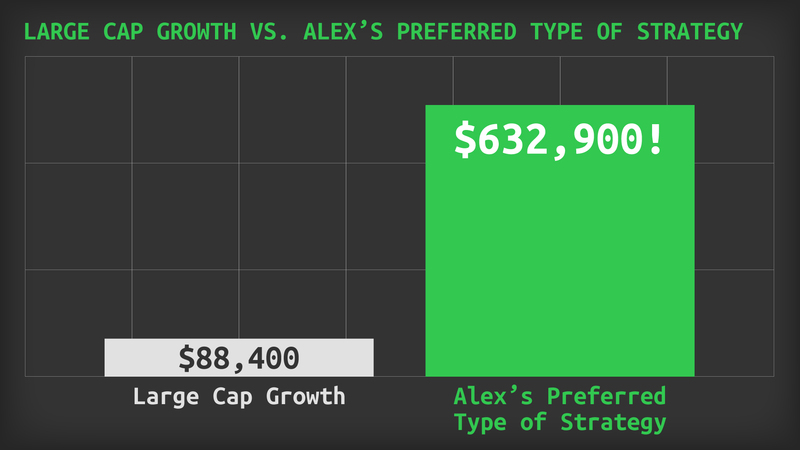 But using Alex’s preferred type of strategy instead, the same $100 would’ve ballooned to $632,900! Today, Alex has authorized me to disclose details of his proprietary system to a small group of people. And you’re one of them. In a moment, we're going to show you his screen so you can see his system in action. What would you do if you opened your retirement portfolio... and it was DOUBLE its current value? 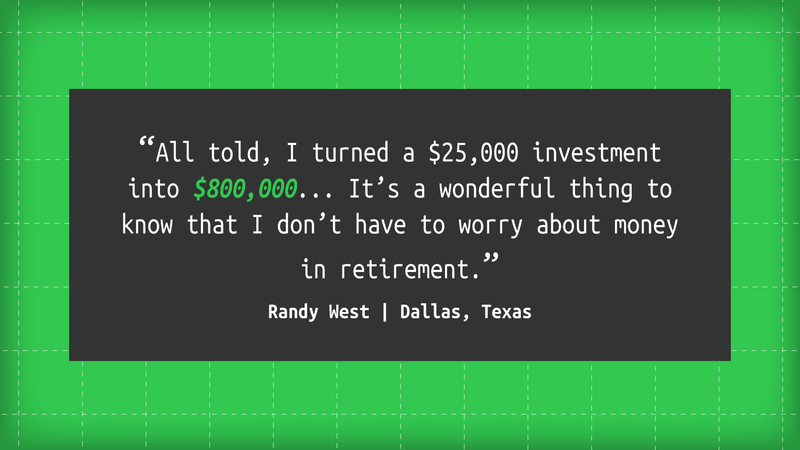 Would you pump your fists knowing you were closer to retirement? Would you breathe a deep sigh of relief? Or would you hug your spouse and pop a bottle of champagne? I want you to be doing exactly that one year from today. Because in the next few minutes, I intend to show you PROOF that you can double your retirement portfolio in a year using Alex’s system. But first, I want to give you a few details on how this strategy works. Now, if you’re following the mainstream media or Wall Street, buying low and selling high is impossible. After all, they write positive stories about stocks only AFTER they’ve gone up. That’s just the nature of these guys. They jump on bandwagon stocks once the gains are already gone. But what Alex does is completely different. His system identifies stocks BEFORE the big run... so you can maximize your profits. And as you’re about to see, by following his system, it’s possible to take just 5% of your portfolio and double the entire thing in a year. We tested the main indicator behind Alex’s system against heaps of historical data, and what we found was remarkable. Alex has delivered extraordinary wins of 407% on Owens Corbin, 511% on Omnicell and 613% on Anthem. But today I want to showcase the full power potential behind this strategy. So all of the extraordinary examples I’ll mention today are best-case scenarios I’ve personally selected from historical data. Back in 2012, people thought the company was going nowhere. The stock was trending downward and traded for just $0.72. Most of the mainstream media ignored it. And even those that covered it, like The Wall Street Journal, had Primo at the top of their “Biggest Losers” list in 2011. But interestingly, Alex’s system registered a GREEN CHECK MARK. Now, what you’re about to see is something we’ve never shown viewers before. Because it uses a special indicator to tell Alex exactly when stocks like Primo are about to turn around in a big way. As you can see, as we scroll through stock after stock, each one is rated with either a red X or a GREEN CHECK MARK on the right. The system works just like you would think. Alex avoids the red Xs and looks only for the GREEN CHECK MARKS ✔. And sure enough, when looking back to October 25, Alex’s system registered a GREEN for Primo. Just weeks later, Primo published a press release announcing a landmark three-year partnership with Cuisinart. The stock took off like a rocket ship. You could’ve walked away with $108,550! In other words, you could have taken just 5% of a $100,000 portfolio... and more than doubled it on one trade. And this wasn’t just a one-time event. It was trending downward to a low of $1.36. As you can imagine, the media wasn’t exactly falling over themselves to report anything positive about the stock. In fact, we reviewed the archives of Forbes, The Wall Street Journal, MSNBC, The New York Times and CNN. And we couldn’t find a SINGLE bit of evidence that they knew Gray Television was about to go on an epic run. But big things were around the corner. 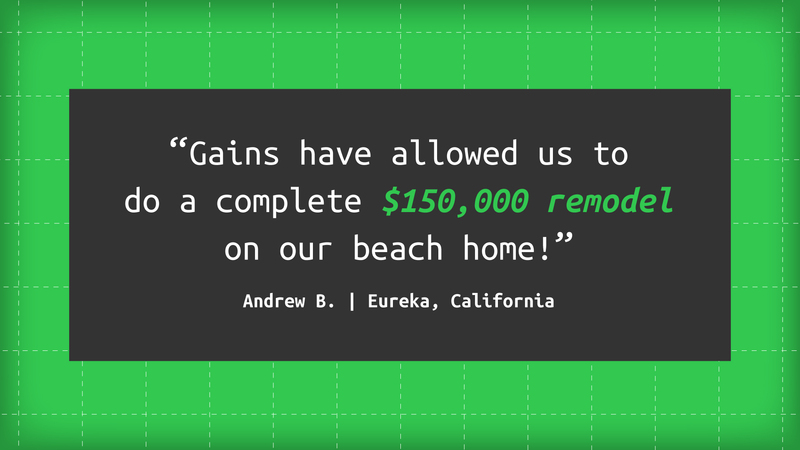 Alex’s system registered a GREEN CHECK MARK – the price was FAR too low. And days later, Gray started to move. There’s no telling why the mainstream media missed it. Perhaps they were too busy to focus on a small stock like Gray Television. But they completely missed the big story that Gray had adopted an entirely new management structure. And that, as a result, Gray had captured the No. 1 or No. 2 market share in 29 out of 31 markets. 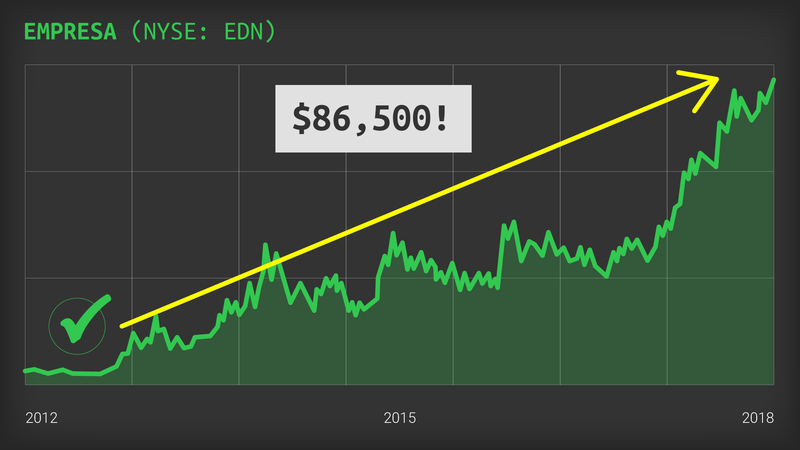 If you’d placed a small trade of $5,000, you could’ve turned it into $66,100. The company was on a significant downswing all the way to the $2 range. 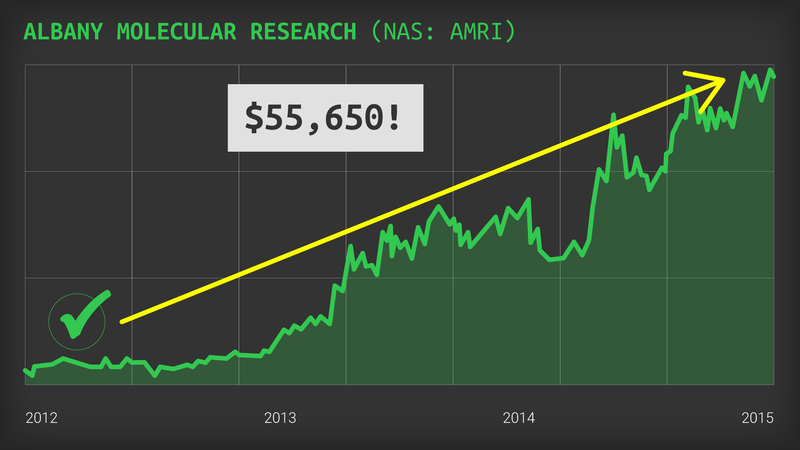 The investing website archives we reviewed were downgrading stocks like BioTelemetry – and bashing the big slump in medical testing stocks. But once again, Alex’s system registered a GREEN CHECK MARK. 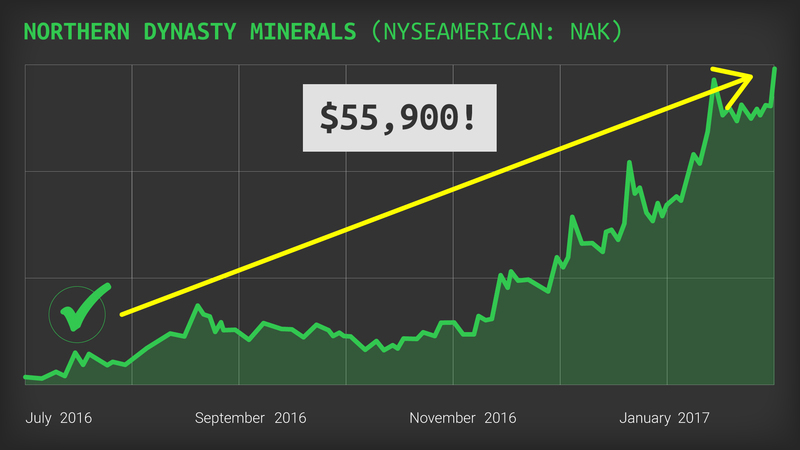 Looking back on November 20, its metrics indicate that the cheap $2 price was too good to last, and the stock was set to blast off. You could’ve watched it balloon into $84,350! If you never thought profits that big were possible... I don’t blame you. Exceptional gains like these certainly don’t happen every day... particularly if you depend on the media for your information. 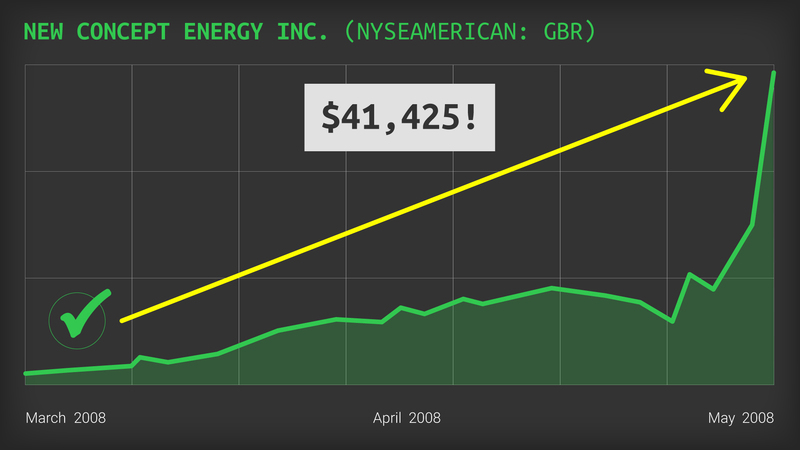 Imagine what even a small fraction of gains like these would do for your bottom line! Giving you a real chance at doubling your nest egg in the next year. And Alex is no stranger to showing his readers how to double... triple... even quadruple their investments. Stories like these are only possible thanks to Alex and his unique expertise. But how exactly does his system give his subscribers such an advantage over everyone else? To understand that, you need to know a bit about his story. But when Alex first entered the financial advice business as a broker, he wasn’t very good at it. But it’s true that Alex really was a bad stock picker early on. So he dug in... and started studying the greats... men like Warren Buffett, Walter Schloss and Benjamin Graham. And I mean meticulously studying. He was determined to find out what the legends were doing that the average investor wasn’t. And he uncovered stark differences. And they have access to heaps of cash and multimillion-dollar computer terminals that run complex algorithms in milliseconds. They’re using the most powerful, proven systems in existence. Unlike people, these systems don’t invest based on emotion. They care only about the metrics they’re designed to examine. 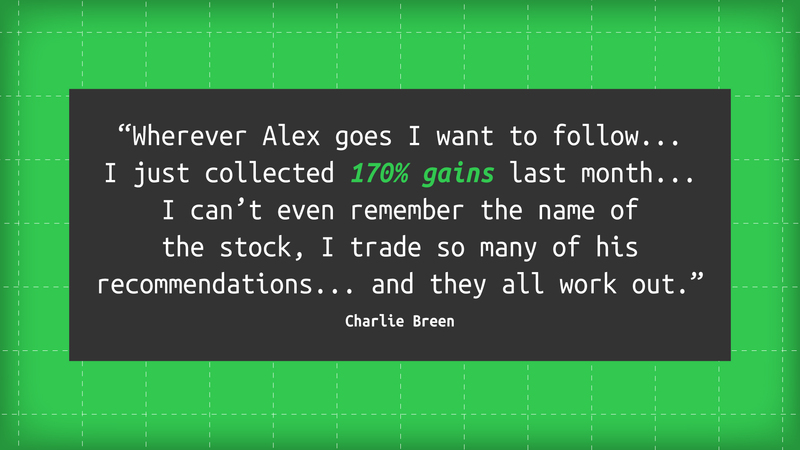 Alex realized that in order to succeed in the stock market... you need a system that works. One that could outperform the markets TENFOLD or more. He did just that... and quickly became the top producer at his firm. He’s been tweaking the system ever since... and it’s become incredibly powerful. Today, Alex has moved on from his firm, determined to share the power of his system with his readers. $25,000 invested over time in the S&P 500 could have made you as much as $9,600 in profit. More than 10 times more! And today, Alex wants you to experience the power of his system... and give you the chance to pull in the biggest returns of your life. We’re talking about gains of 100% and higher... the kind that can help you DOUBLE your entire portfolio in a year. Better still, Alex’s system is so powerful, he’ll show you how to do it using just 5% of your portfolio. Given the retirement crisis in America today, this is an absolute godsend. Regular Folks Are Missing Out! 35% of adults in the U.S. have less than $1,000 saved... and another 34% have nothing saved at all! Simply put, the old, traditional ways of investing do NOT work anymore. 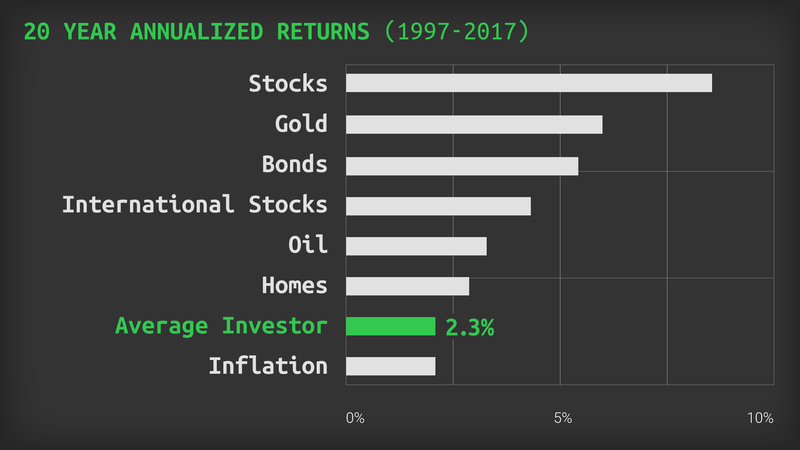 A study by J.P. Morgan Asset Management found that the average investor managed just a 2.3% annualized return over the past 20 years. But with the help of Alex’s system, you can now do the exact opposite! It’s geared toward buying at the lowest possible point... and then riding it to new 52-week highs! It’s only by doing this that you have the chance to double your retirement nest egg using just 5% of your portfolio... all in the next year. You can’t rely on Wall Street or the mainstream media to get you there. The media is simply too slow! Media outlets report incorrect information, give bad recommendations and post news after it’s too late to cash in. When’s the last time you saw a so-called expert on TV recommend a stock that then took off and made you a fortune? By the time they report on a company, the big money has already been made. You need a way to get in BEFORE the stories break... BEFORE the stocks move. 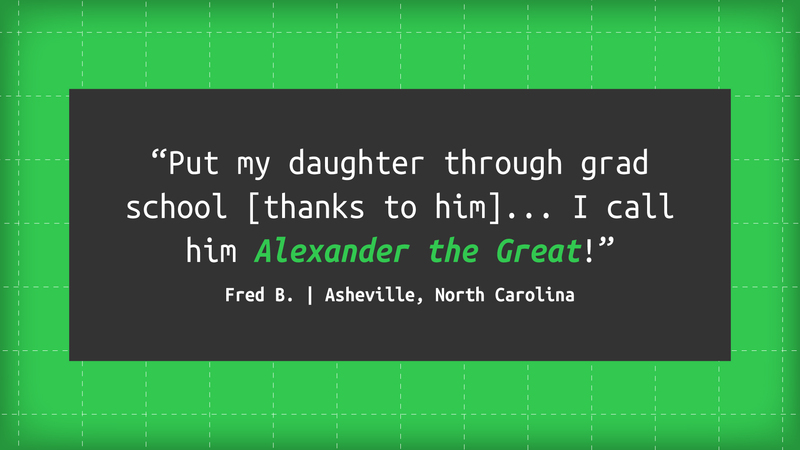 That’s exactly what Alex’s system can help you accomplish. 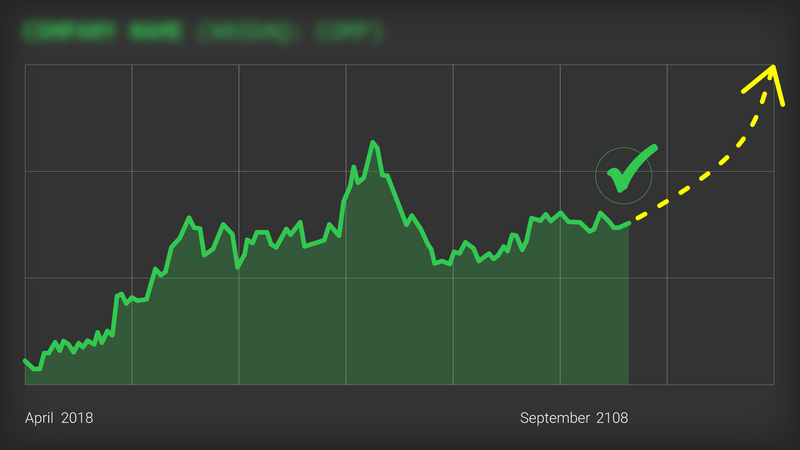 Looking back at August of 2017, the company was well below its 52-week high of $20.25. As a result, the media was ignoring it. Beaten-down companies don’t produce big ratings. But Alex’s system registered a big GREEN CHECK MARK on August 23, 2017. Sure enough, the stock climbed. You could’ve walked away with $55,800! In fact, The Wall Street Journal’s big story that day was about a Jared Kushner loan. When a story like Catalyst Biosciences could do something to really help people! If you’d waited on the media, you’d have missed out on some serious money. The stock had fallen from its all-time high to just $2.09 in November. You wouldn’t have heard anything about it on ABC or CNN or in The Wall Street Journal. I looked through their articles from that time... they were all ignoring it. But Alex’s system registered a BRIGHT GREEN CHECK MARK. 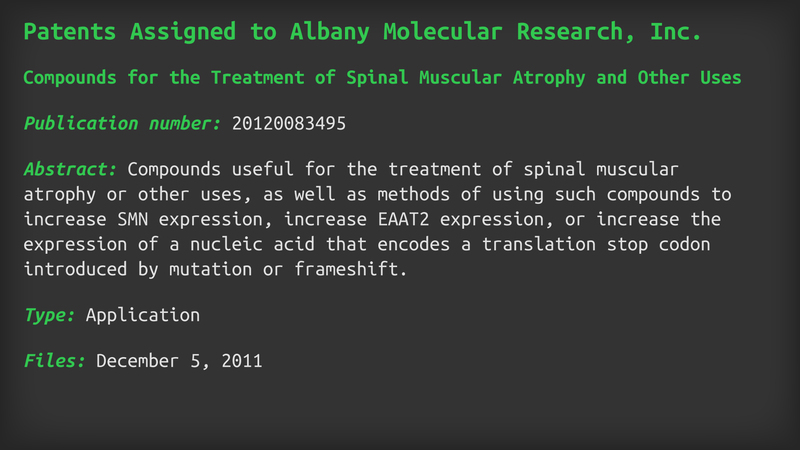 And get this... just six days later, Albany filed a patent for new compounds useful for the treatment of spinal muscular atrophy. The stock shot up 1,013%. You could’ve quickly closed out $55,650 richer. But if you’d waited on the media... you’d have missed out entirely. 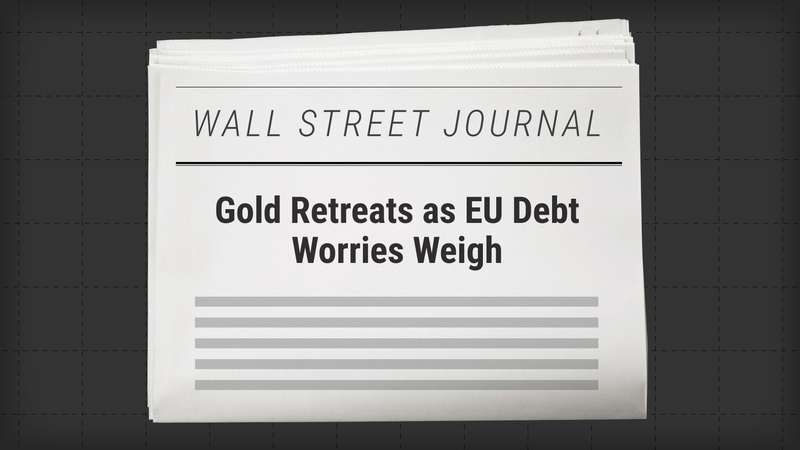 And The Wall Street Journal was dialed into the EU’s budget reform and its effect on gold prices. The media totally missed the boat on that huge moneymaker. 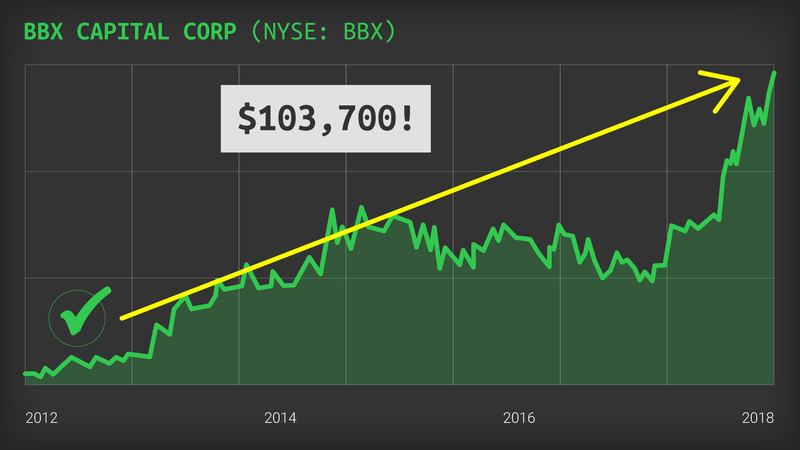 It had fallen from $11 to $4 on the year, and had Alex told anyone to buy at that time, they probably would’ve called him crazy. But looking back, his system indicated the stock was set to move. 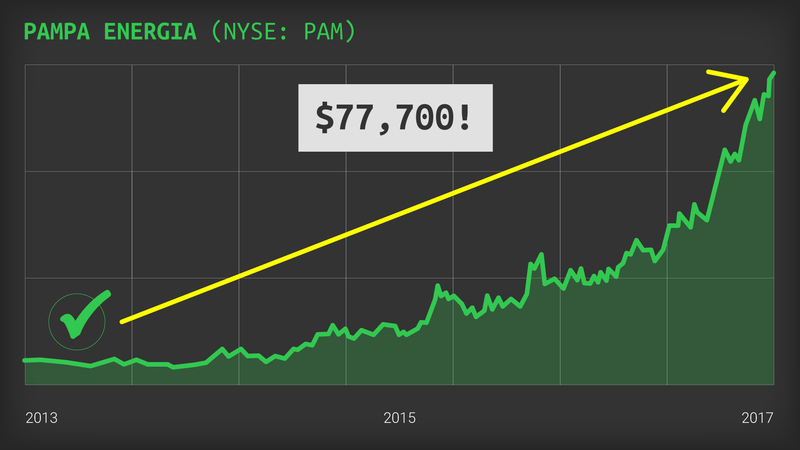 And if you’d placed a quick, easy $5,000 trade, you could’ve watched your money grow to $77,700! As usual... the media missed it. They were fixated on a Facebook acquisition instead. If you’d waited on the media to feed you information on those three trades, you’d have missed out entirely. 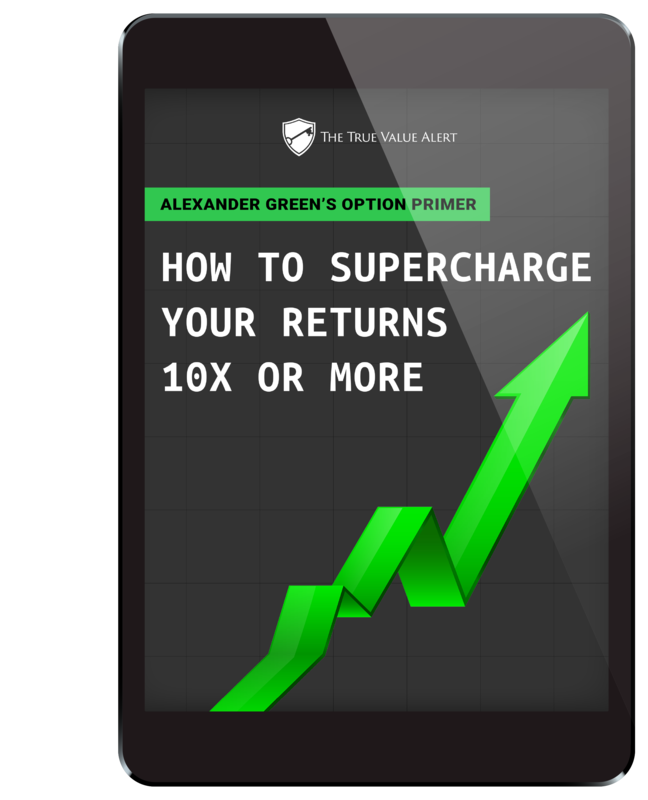 But by following the indicator behind Alex’s system, just $5,000 in each one could have handed you $189,150... enough to double a $100,000 portfolio, and then some! Now, you obviously can’t expect 100% gains on every play... anyone who promises that is flat-out lying. But with Alex’s system, triple-digit wins are not only possible, but frequent! In fact, over the last three years, his system has produced an average of one triple-digit winner every single month! Including top winners like 187% on Legg Mason... 242% on PulteGroup... 407% on Owens Corning... and 613% on Anthem. He wanted to find a way for regular folks like you to get into trades BEFORE major stock moves... allowing you to grab huge gains over and over. In short, with his system... he is able to identify when stocks are at peak profit potential – when they offer the maximum value. Essentially, his system is based on the idea that cost and value are not always the same thing. Imagine for a minute that you’re in the real estate market. You’re looking at two houses. It’s new and shiny... but it’s in a bad neighborhood. It’s the nicest house on the street by far. The second house is cheap and not that nice... but it’s in a great neighborhood. All the other houses around it are multimillion-dollar mansions, and this is the only house that still hasn’t been upgraded. I’d go for the second house every time. The first one has no upside. It’s already the most expensive house on the block. So it has nowhere to go. It has a high COST but a low VALUE. The second one is much more appealing. 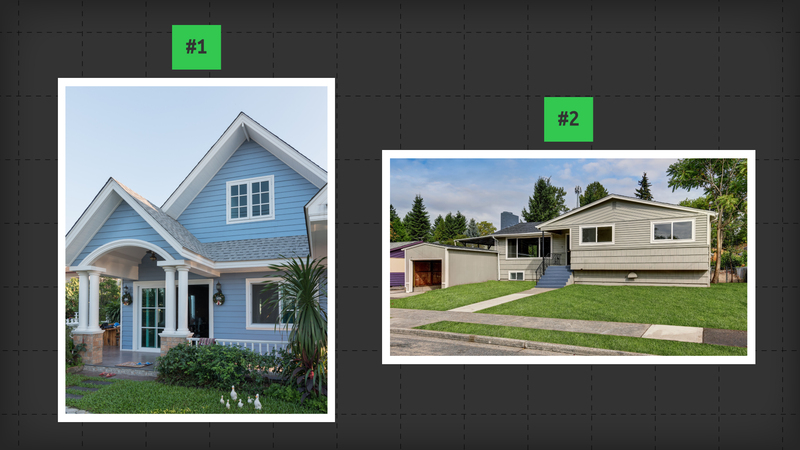 With just some small changes, the value could skyrocket like the rest of the homes in the neighborhood. It has a low COST, but a high VALUE. Some are bright and shiny, but the cost is so high they aren’t worth it. Others are beaten down and unloved... despite having massive potential underneath the surface. In fact, identifying stocks at their maximum value is how legends like Warren Buffett and Walter Schloss built their fortunes. In other words, if you know how to find great companies at severely undervalued prices, you can grow your wealth very quickly. He calls it the Ultimate Value System. It uses a mathematical formula Alex developed to track the “true value” of companies compared with their current market value. When a company is trading far below its true value, its profit potential is at or near its maximum. That’s when the system gives a GREEN CHECK MARK, signaling that it’s time to buy. But if the stock is way overvalued... when it’s really expensive... that’s when it gets the red X.
I know that sounds simple, but the mathematics behind determining a company’s “true value” is actually quite complex. So it looks at revenue, assets, liabilities, growth rate, patents, products in the pipeline, net profits and more. Then, based on all those factors... each company gets a “true value” score. 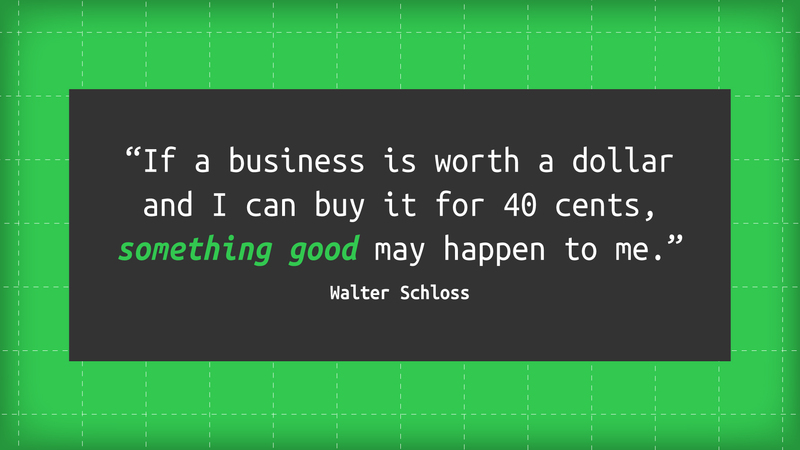 It’s a calculation of what the company is truly worth. And then the system compares that “true value” to the stock price. If the stock price is far below the “true value” of the company... then you know the stock is likely to head much higher. That’s a GREEN CHECK MARK. But if the stock price is very expensive compared with the “true value,” then you want to stay far away. Basically, it’s looking for stocks that are underpriced without good reason. For example, a stock selling for ultra-cheap amid bankruptcy rumors isn’t a good buying opportunity. 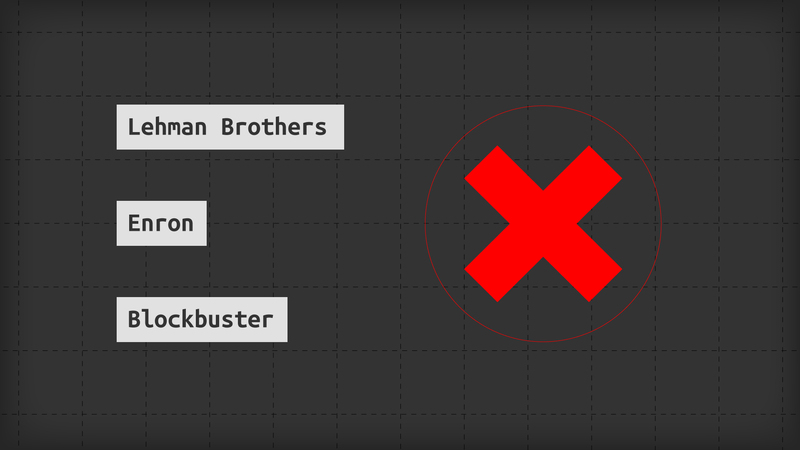 Like Lehman Brothers... Enron... and Blockbuster. Those would get a red X. Those get GREEN CHECK MARKS on the Ultimate Value System. Those three trades could’ve handed you a total of $259,000. Now, you might be wondering... why would a great, profitable company be priced low? 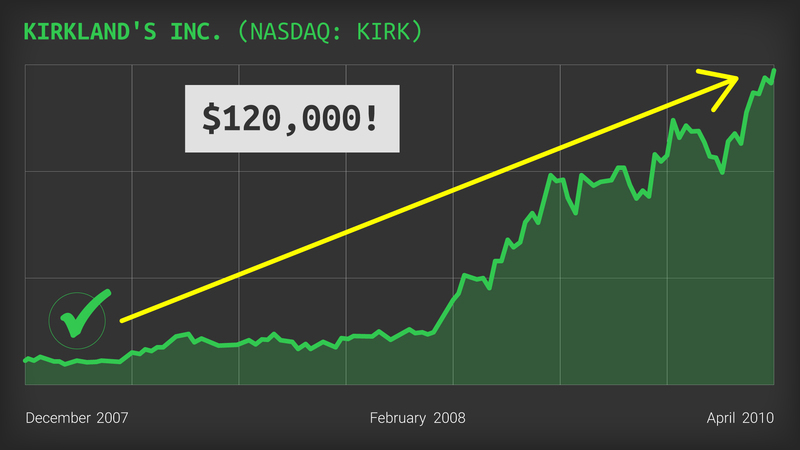 Sometimes a one-time event will sink a stock. Like when Netflix announced it was splitting up its streaming and DVD businesses back in 2011. The stock dropped from $38 to $9. Everyone thought it was a disaster... but it was actually an all-time great value. 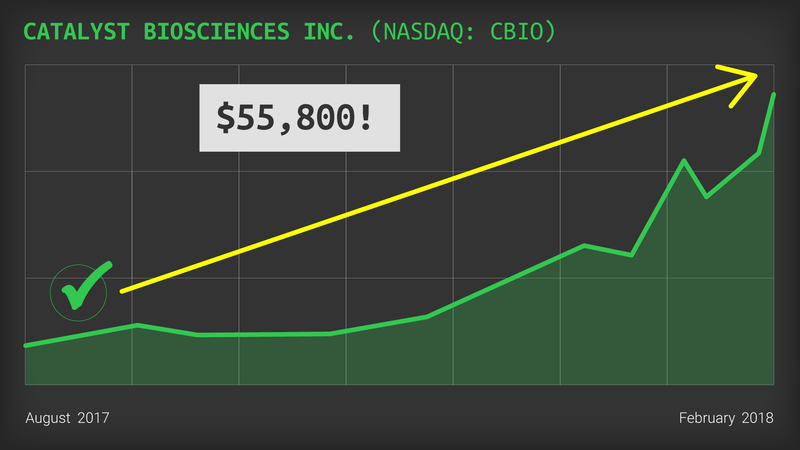 Today, the stock is up from $9 to more than $350! Other times, stocks trade at a great value simply because the media doesn’t cover them. They fly under the radar until suddenly people wake up and realize the company is making a ton of money. So when the GREEN CHECK MARK flashes, you’ll want to pay attention. Then close out for big profits. Of course, no system or strategy is perfect, so it’s not going to get it right every single time. But all you need to do is place an easy trade for the chance at big gains. Alex’s system absolutely nailed it. 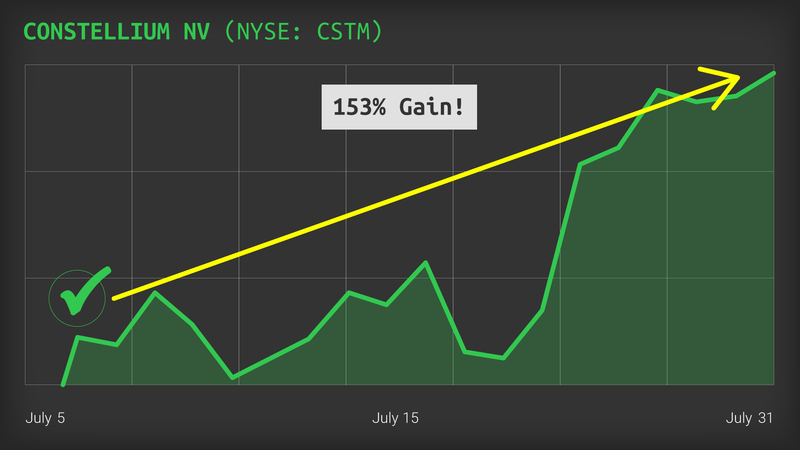 The stock turned around, and in a matter of two months, Alex’s readers had the chance to pocket a 263% gain on a special play. Then there was Constellium, the world leader in aluminum products for the aerospace, auto and packaging markets. 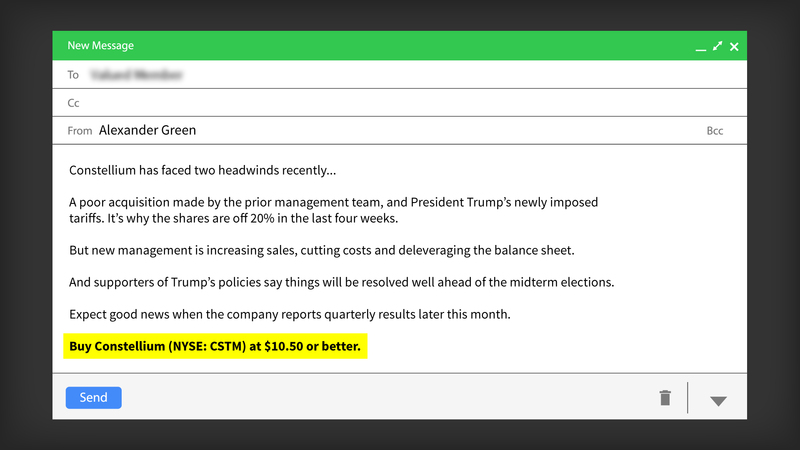 The Ultimate Value System flashed green on July 5, 2018, and Alex shot his readers a note. Alex’s system was spot on again. And his readers had the chance to double their money and then some (153% gains) on a special play in just three weeks... before the month was even over! The Ultimate Value System can alert you to these opportunities over and over... BEFORE the stock starts to move. And looking back on June 24, the system registered a GREEN CHECK, signaling a buy... (that’s step one). But the Ultimate Value System makes it easy to profit. So you can get in BEFORE the big moves happen. The stock wasn’t making headlines. In fact, I couldn’t find a single news story on it anywhere. 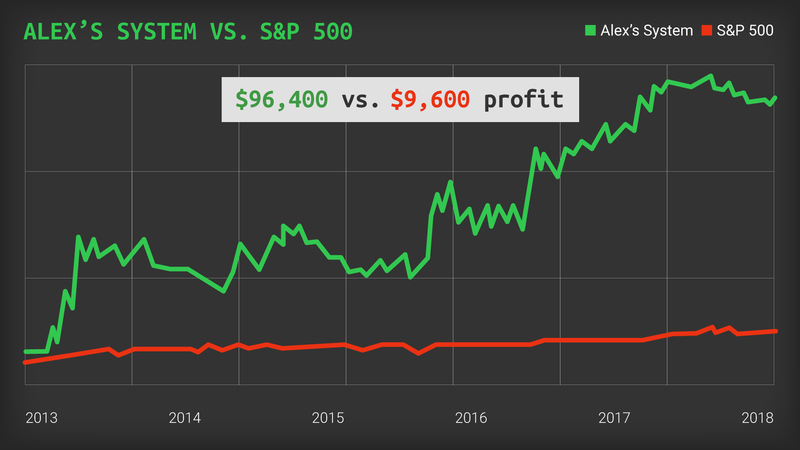 Alex’s system calculated that the profit potential on April 15 was more than 343%. So it registered a GREEN CHECK MARK. 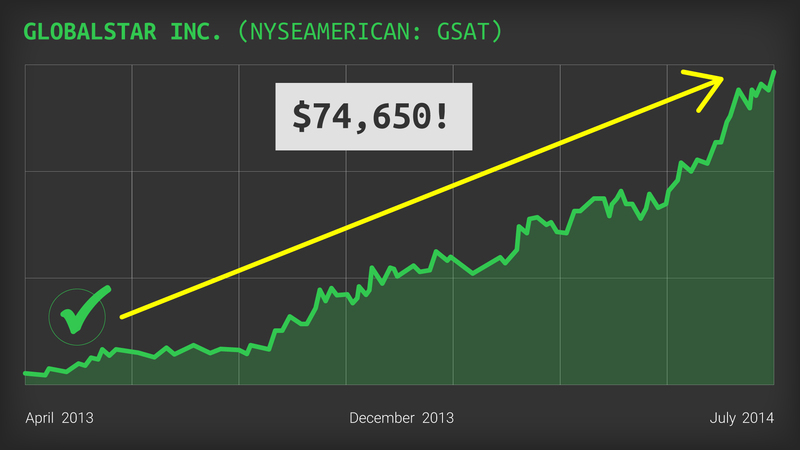 And you could’ve walked away with an easy $74,650 in profits... on a $5,000 investment. 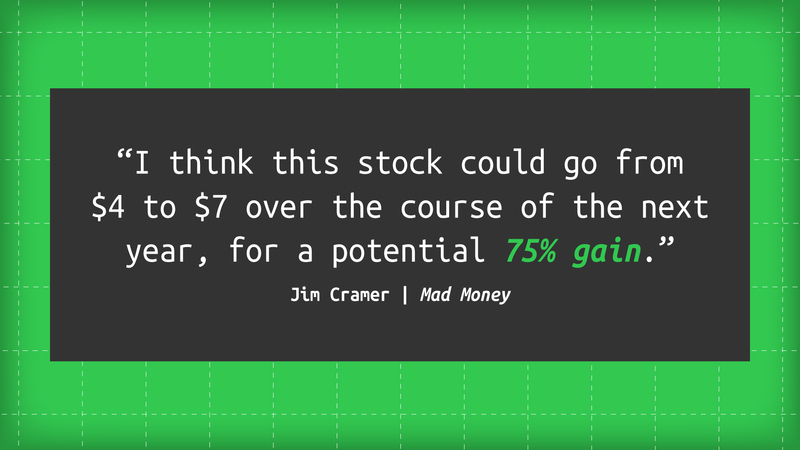 Jim Cramer, of Mad Money fame, didn’t recommend the stock until it had already run up more than 1,400%! Thanks, Jim... but I think we’ll stick with the 1,400% gains instead. But the Ultimate Value System registered a big GREEN CHECK MARK. The price shot through the roof. You could’ve turned $5,000 into $86,500! That’s why we’re guaranteeing the Ultimate Value System will show you how to double your retirement account in the next year. Whether it’s cash... a struggling bond... a stock that’s gone nowhere. We all have one or two losers that we’ve held far too long. 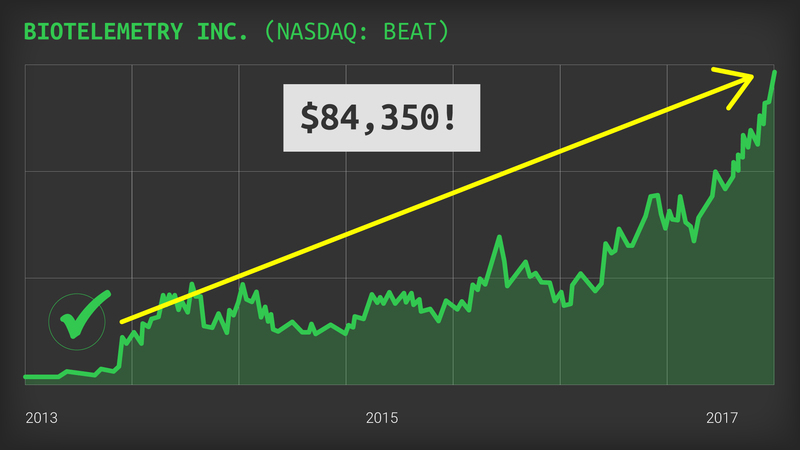 Now imagine taking that underperforming part of your portfolio... and turning it into a set of winners so big that your entire portfolio grows by 100% in a year! It’s only possible with Alex’s Ultimate Value System. The gains you’ve seen up until now were based on Alex’s old system. He’s now had a full five years to perfect it, and he expects his new and improved “Ultimate Value System 2.0” to blow the old numbers right out of the water. Because this is the first time Alex has unleashed his improved system, there’s really no telling just how much money you could make. But our research clearly shows that this system could’ve quadrupled your money on any number of past plays. See, for the last few years, Alex has been carefully tweaking the formula behind his system. We’ve been in a bull market so long now, he found that weighting certain metrics more heavily produces better results. For instance, right now it’s more important than ever to consider a company’s industry before investing. So what the Ultimate Value System does now is not only target specific companies but also specific sectors that are hot. It was trading at 78%, too low based on the “true value” of the company. 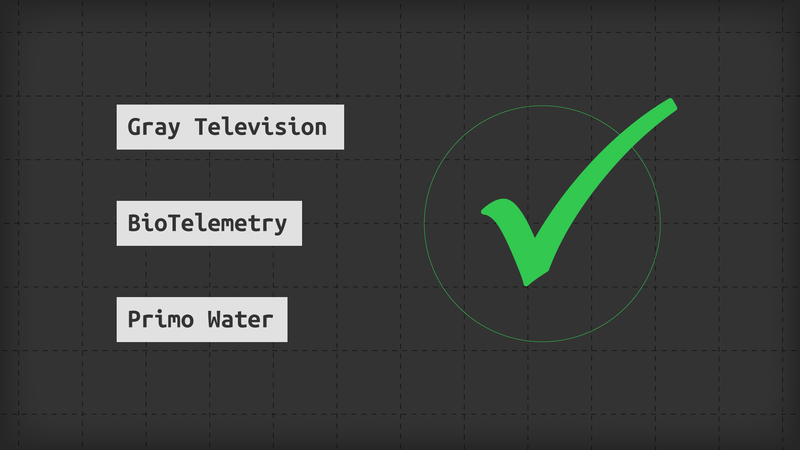 The system registered a big GREEN CHECK MARK. The stock started moving up immediately and never looked back. You could’ve quadrupled your money in just over a year. All told, the stock rose 2,074%. 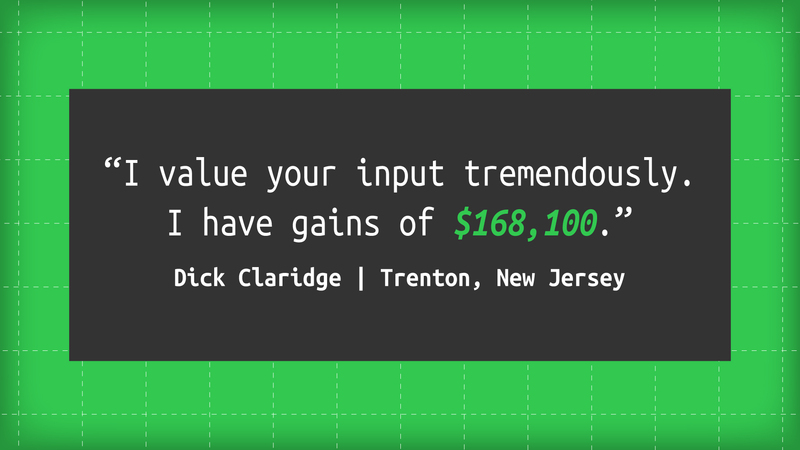 And you could’ve turned $5,000 into a $103,700 gain! 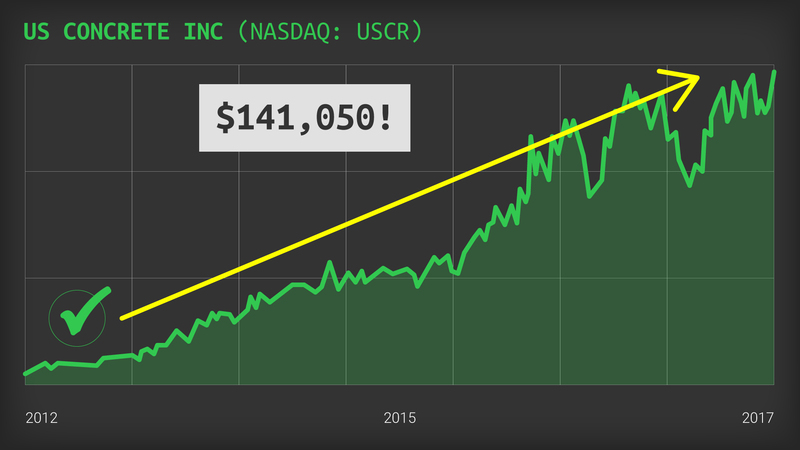 It would’ve told you to buy... ultimately giving you the chance at $141,050 in profit! That would more than double a $100,000 portfolio. 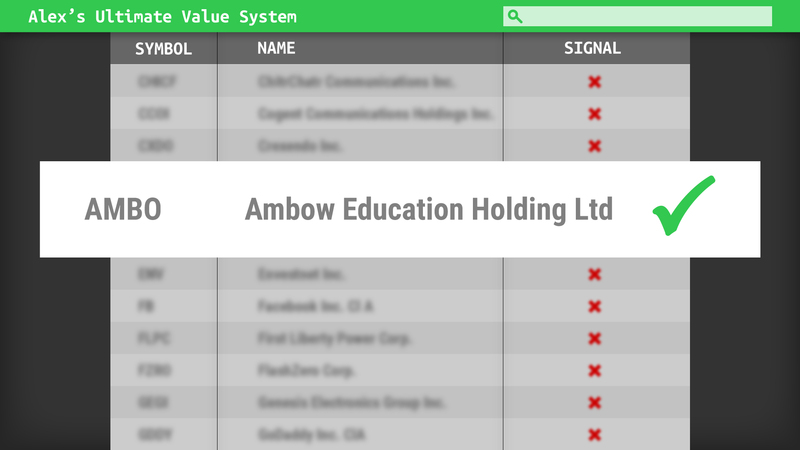 And looking back at the end of March, the system registered a GREEN CHECK MARK again on Ambow Education Holding. Enough to turn $5,000 into a life-changing $372,650! That would nearly quadruple a $100,000 portfolio! You can see why we’re confident guaranteeing you the chance to double your portfolio in the next year by investing just 5% of it. Now, if you’d rather simply paper trade for a while, that’s fine too. A lot of people like to get their feet wet that way. Simply follow along with Alex’s recommendations via the model portfolio, and I guarantee you’ll see it double. And $50,000 could double a $1 million portfolio! All in the matter of a single year. All you need to do is follow along with Alex’s system. Because his Ultimate Value System is blinking GREEN right now! The Ultimate Value System Is Showing a Big GREEN CHECK MARK... This Could Be the Company That Doubles Your Entire Portfolio! As you can see, Alex’s system is showing a big GREEN CHECK MARK. And while its sales have been steadily growing for the last five years, the latest projections show it absolutely blasting off. 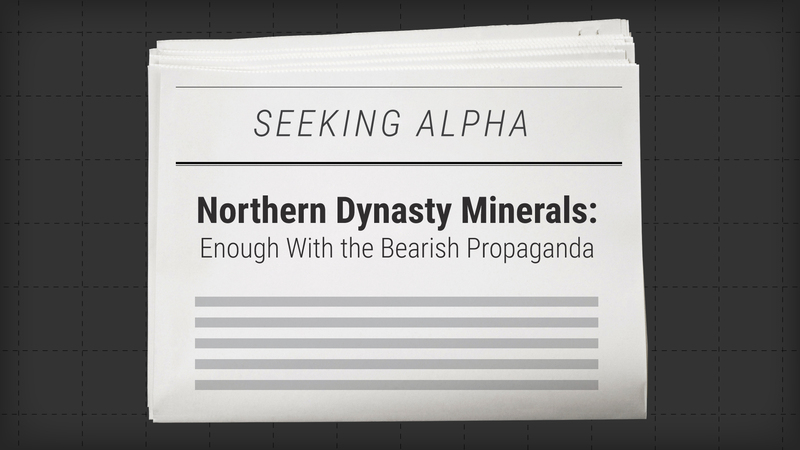 It has 10-bagger potential written all over it. And sends the stock to the moon. If you wait to hear about it from the media, you’ll miss out on the biggest gains. 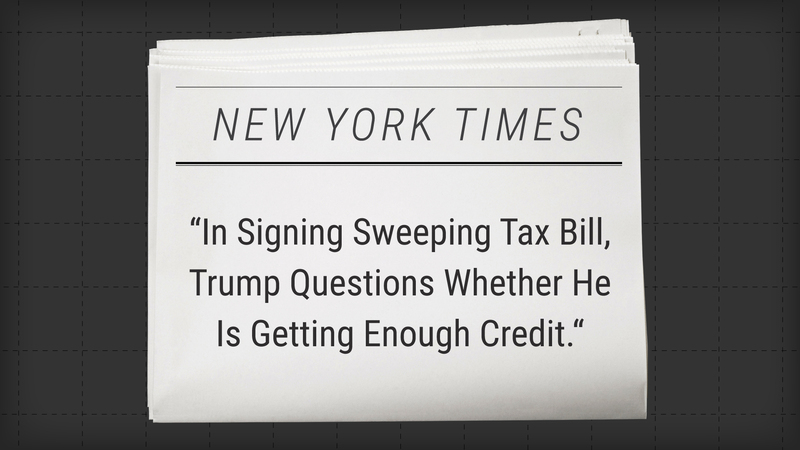 We know they report the big news only AFTER the gains are gone. So here’s how you can get started with this trade... plus every other play Alex targets over the next year. You can gain access through a password-protected link where we are alerting Alex’s readers to his next big play. Alex has insisted that no more than 500 people receive access today. He wants to ensure that the group stays small so everyone gets his recommendations at the best possible price. If thousands of folks bought in at the same time, the price could move up very quickly, preventing you from getting the biggest potential gains. So the moment 500 people are in today (likely in the next hour or so), I’ll need to stop giving out the link. That’s why I’d like to send you the access link now if you’re ready to learn how you can truly change the performance of your portfolio. Remember, the Ultimate Value System holds the power to double your retirement account in the next year using just 5% of your portfolio. And The Wall Street Journal hasn’t run a feature. So this is the calm before the storm. But the big GREEN CHECK MARK tells us that something BIG is brewing. The company is far too undervalued to stay where it is for long. And the moment investors notice, Alex expects the price to skyrocket. So if you’ll allow me, I’d like to send you the special link with details right now. It’s all part of a unique project Alex has put together for folks like you. And gives you detailed analysis and research you won’t find anywhere else. Alex calls his service The True Value Alert. To help you find stocks trading far below their true value, just before they blast off. It’s the same type of strategy that’s helped the legends build some of the greatest fortunes of all time. For example, billionaire hedge fund manager Seth Klarman used it as part of his investing approach to generate $22.6 billion for his clients. The stock has nearly doubled since. By our calculations, Klarman’s fund made up to $50 million in quick profit! Then there’s Ricky Sandler, who built the $6.5 billion hedge fund Eminence Capital with this same type of strategy in mind. 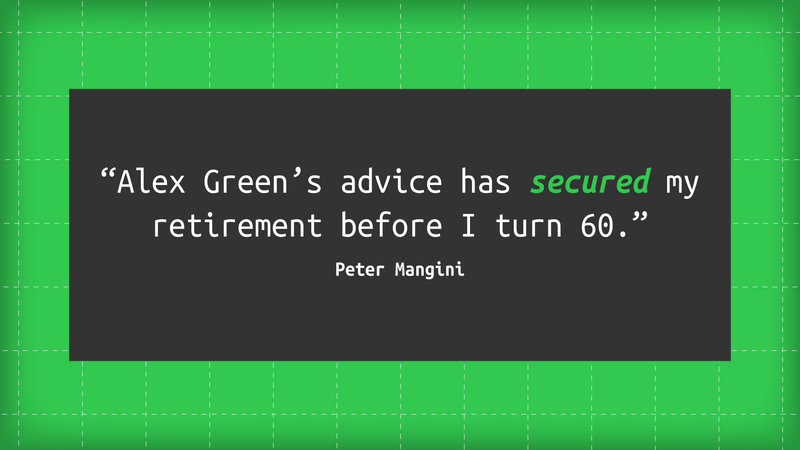 He once put $195 million into Keurig Green Mountain when the stock was trading for $50. He made a public pitch that it was far undervalued and should be trading between $80 and $100. One month later, the private equity firm JAB Capital paid $91.67 per share to acquire the company. Especially with just 5% of your portfolio! EACH DAY: The Ultimate Value System is running constantly. 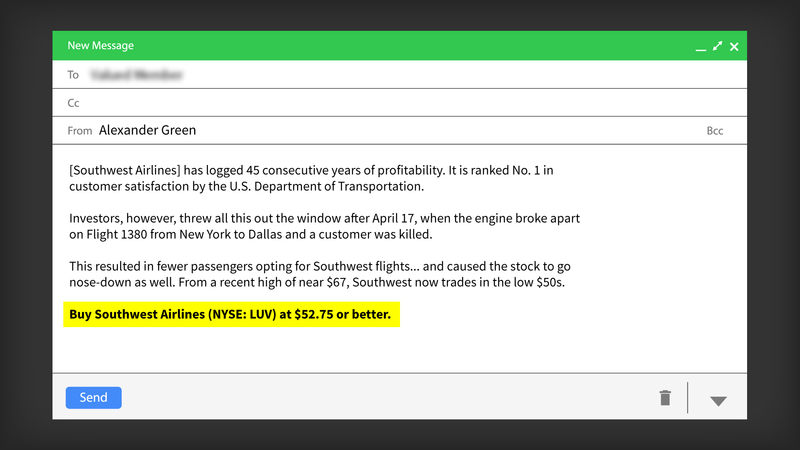 It analyzes and scans the market for the best picks every day. And Alex looks for only the very best plays. He looks for those rare companies with a GREEN CHECK MARK. And then he does his own deep analysis to see if a big catalyst could send the stock much higher. EVERY WEEK: Alex will send an alert directly to you at the beginning of each week. It will contain updates on his favorite “true value” plays. Plus, several times each month, you’ll get a BIG recommendation of a stock in the best position to fly up the charts. You don’t want to miss these. They include what action to take, the entry point and when to take any profits. 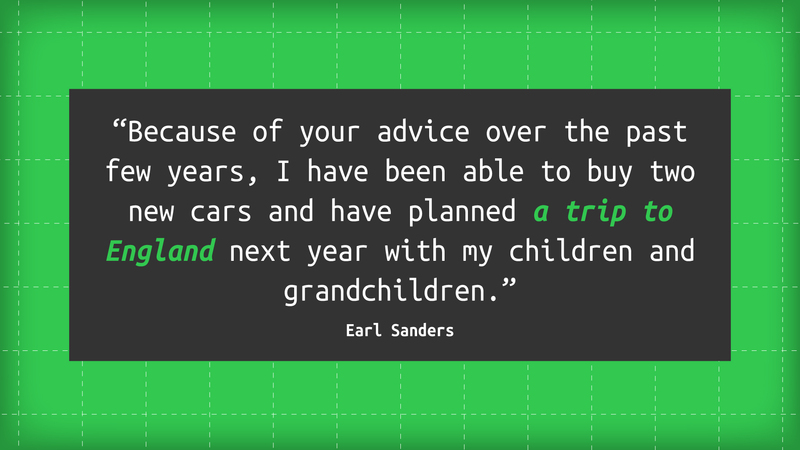 You’ll get an average of 24 BIG recommendations each year! You just sit back and wait for Alex to deliver this winning research and analysis straight to your inbox. With the Ultimate Value System working for you, there’s no reason you can’t see the same level of success as these folks. Get Alex’s Email, Place Your Trade, Watch It Soar! You simply wait for Alex’s recommendations to arrive in your inbox, decide if the opportunities are right for you, place the trades and collect the cash. 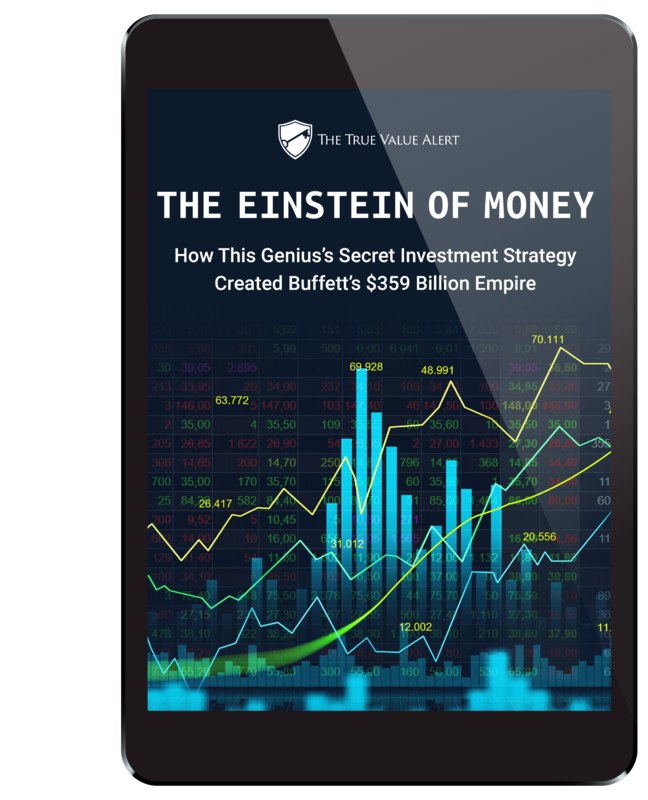 So this briefing could forever change the way you look at money... and investing. Alex requested that we get this in your hands – a $149 value – for FREE today. 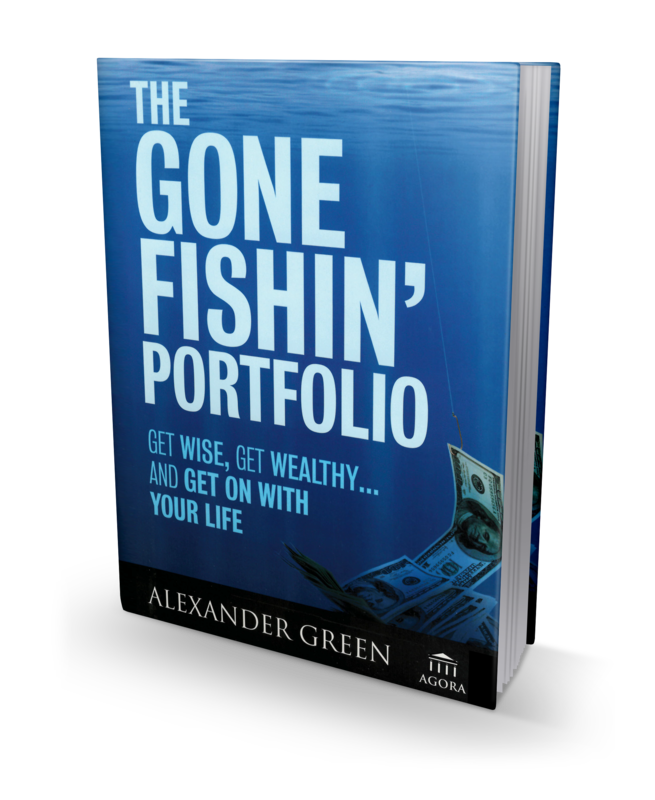 You’ll also receive a FREE copy of Alex’s blockbuster book The Gone Fishin’ Portfolio. The five-star reviews on Amazon are endless. Some people are charging upward of $70 for the hardcover. It’s selling for $72.62. But it’s FREE for you. I’ll shoot it right over to you in an email. Now’s the time to get in... before the media catches on and the price goes soaring. Everything you need to know about the trade recommendation will be in that link. Everything I’ve Mentioned So Far Can Be Yours FREE! And Alex’s $70-value best-seller, The Gone Fishin’ Portfolio. 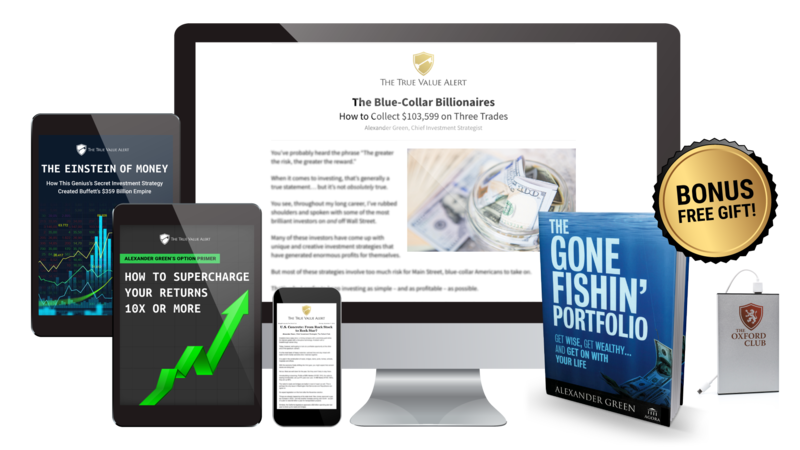 Every one of these free bonuses is yours the moment you join Alex Green’s True Value Alert service. And, remember, not one of these happy subscribers has had the chance to access Alex’s new and improved system. As you can imagine, developing such a powerful system wasn’t cheap. 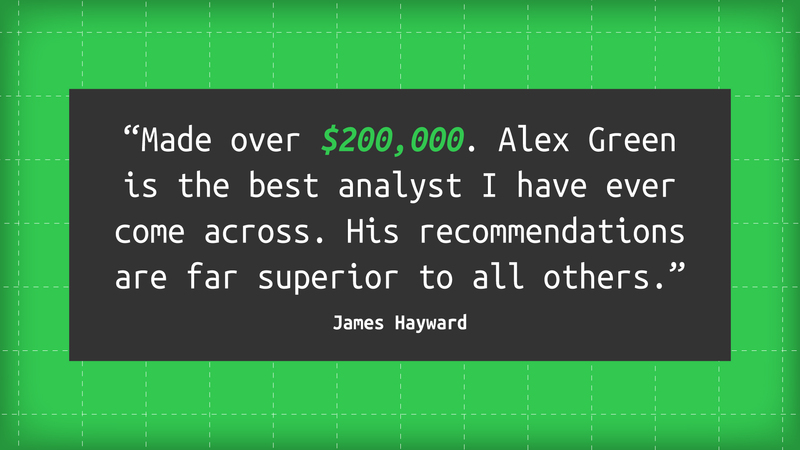 Alex has dedicated thousands of hours to making it the very best investment tool in the world. He’s got a dedicated team of 10 full-time researchers and analysts. 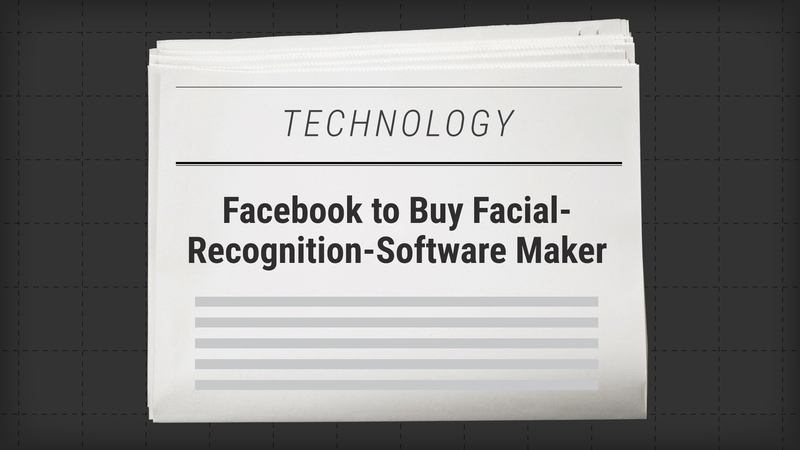 The same software used by top hedge funds to move BILLIONS of dollars every day. His system has taken a full five years to perfect. A flat $5,000 in each would have handed you $259,800 in profits. 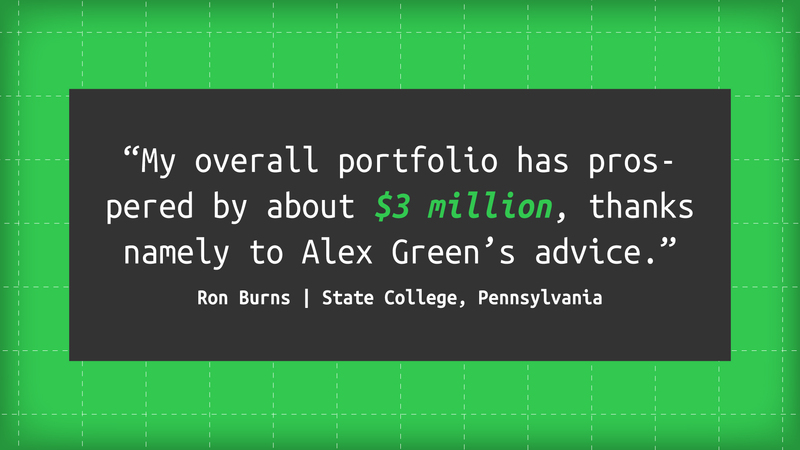 So you can see why Alex believes he can easily help you double your portfolio. Even more astounding, that list is just a sample of the 37 triple-digit winners Alex produced in the last 36 months. He’s handed True Value Alert subscribers one chance to double their money (or more) every single month! And here’s what’s incredible... the wins above all came from the original Ultimate Value System. We expect Alex’s improvements to take performance to a whole new level this year. We also found that the newest version could have identified stocks with moves as high as 2,074%... 2,821%... even 7,353%! That’s enough to turn $5,000 in each into a $612,400 fortune! And while it’s 100% legal, there’s no doubt this system gives you an unfair advantage. 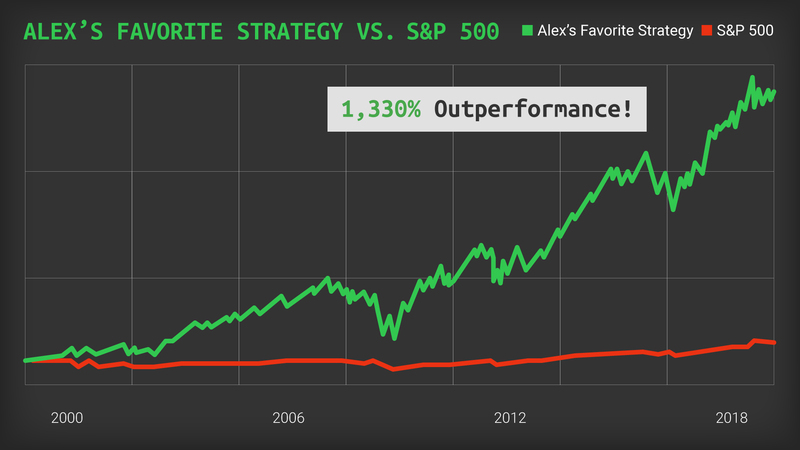 In fact, in back-testing since 2000 – the same year Alex started at The Oxford Club – stocks that met the criteria of his Ultimate Value System have outperformed the markets by 1,330%! The No. 1-performing hedge fund last year – BlueCrest Capital – produced just 57%. Yet it’s typically charged 2% in fees... and kept 20% of profits for itself. On a $100,000 profit, your cost would be well over 20 grand! But you won’t pay anywhere near that today. You won’t pay $10,000... or even $5,000. Since Alex can accept only 500 subscribers to The True Value Alert today, he wants to make sure he doesn’t lose anyone over the price. I’ll give you all the details on the offer in a moment, but first let me address a few common questions regarding Alex’s system. Question: How much money do I need to get started? 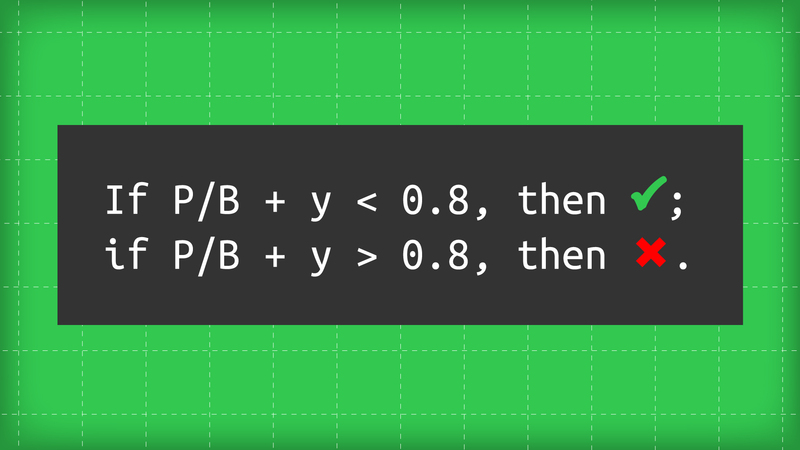 Answer: If you choose to subscribe and use Alex’s strategy, you can start with as much or as little as you’d like. We recommend starting with 5% of your portfolio in order to double it in the next year... but feel free to start with less – say, 1% – and work your way up. It’s entirely up to you. Of course, don’t invest money you can’t afford to lose. Investing carries a level of risk, no matter how powerful the system is. Simply take a small portion of your portfolio that hasn’t been growing (perhaps it’s even been losing you money)... and put that portion to work. Make it do the heavy lifting to potentially grow your overall portfolio by DOUBLE. 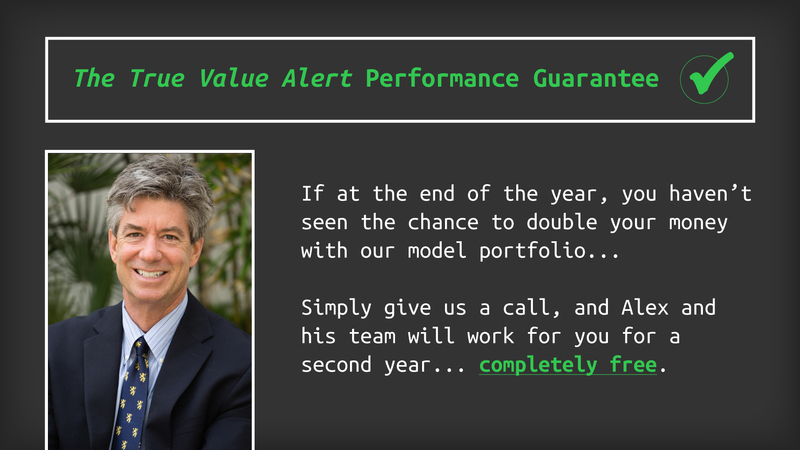 And remember, you don’t even need to invest in order to take part in Alex’s True Value Alert or his guarantee. Feel free to paper trade or just follow along with his research. Question: Does this system work in down markets too? It works just as well in any market condition... up, down or sideways. By the time the dust settled, the S&P 500 had lost nearly 57%. But even in one of the worst economic downturns in U.S. history, the Ultimate Value System could’ve pointed you to massive winners. Looking back, Alex’s system registered a GREEN CHECK MARK on December 28. While the market tanked around it, Kirkland’s blasted off. Enough to turn $5,000 into $120,000! And Emergent headed for the moon, even while everything else crumbled. While folks were going bankrupt all around, you could’ve turned a $5,000 investment into $25,800. But then the company exploded higher. And with a $5,000 investment, you could’ve cashed out three months later with $41,425. If you were lucky enough to hit all three of these, you could’ve turned just $5,000 in each into a $187,225 windfall. 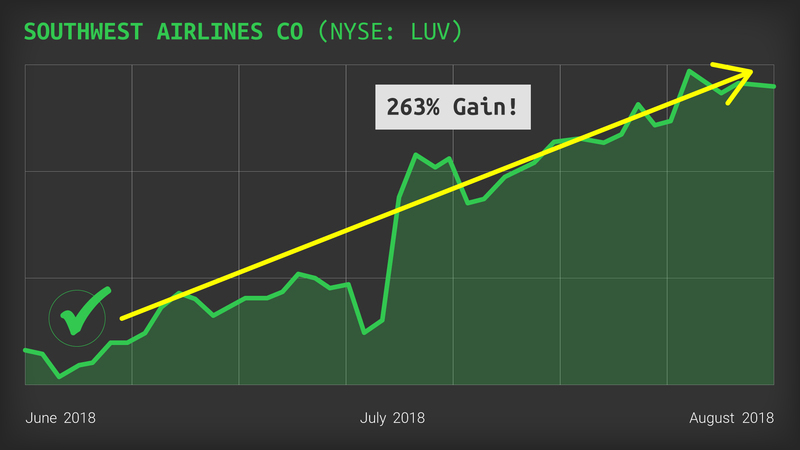 And while we haven’t seen gains like these in real time, the results have been extraordinary – and the full profit potential is simply undeniable. Here’s what I want you to take away from this. The reason these stocks were able to succeed... even during the worst financial collapse of our time... was because they already were trading at such great values to begin with. 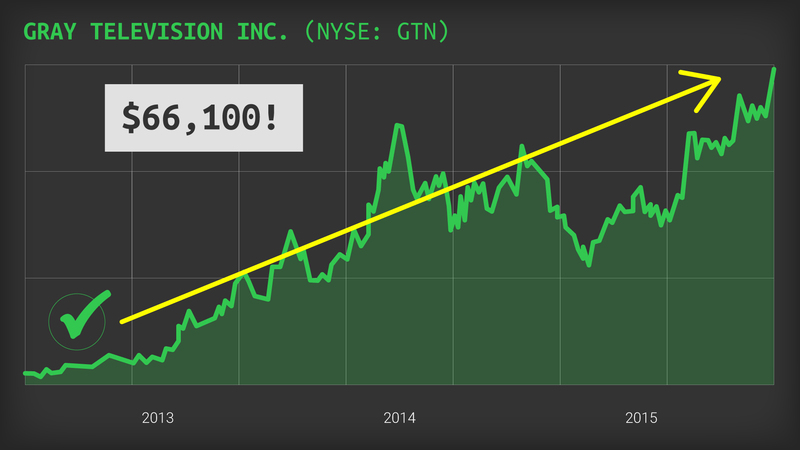 When you buy stocks trading far below their “true value,” they have almost nowhere to go but up! This is crucial to making money in all markets. 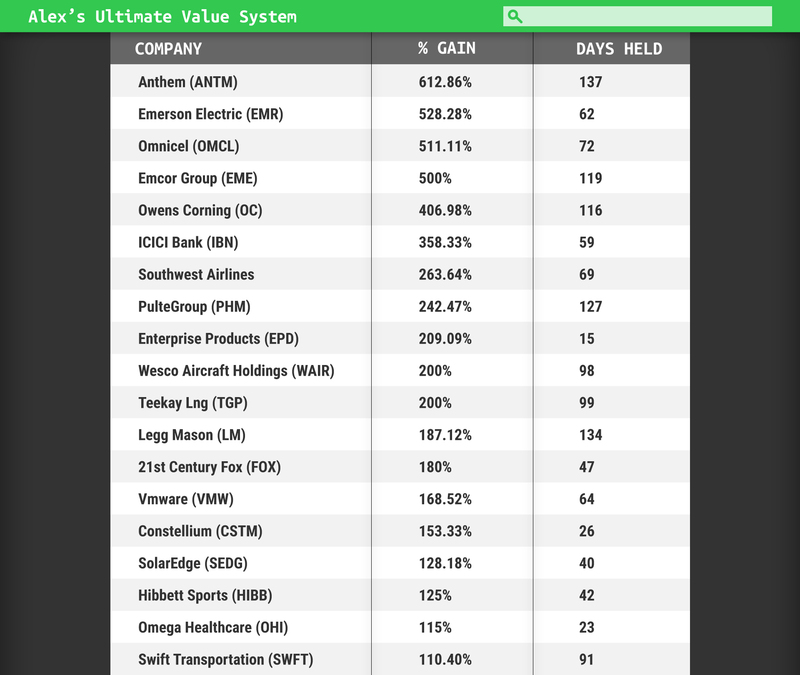 And the Ultimate Value System is the ONLY way I know of for you to identify stocks trading far below their true value. Question: Can I expect to double my portfolio on one stock, or will it take several? Answer: The goal with The True Value Alert is to find you the perfect stock... over and over again. Sometimes that will lead to one big winner. 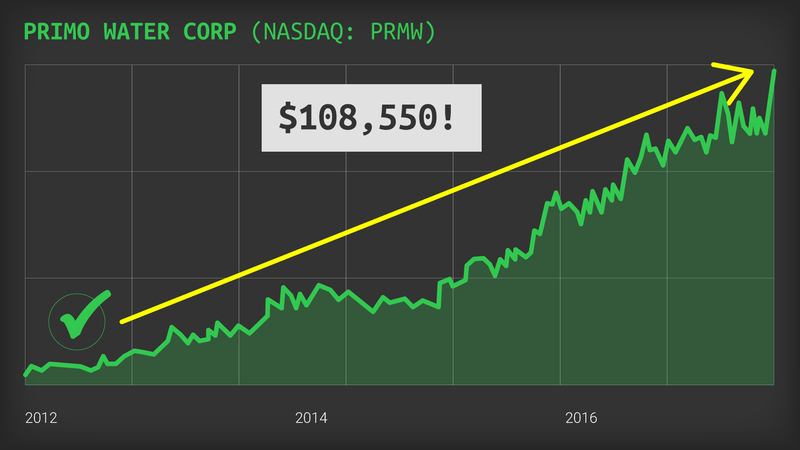 We’ve gone over exceptional stocks we found looking back in the market – like Primo Water, which went up 2,071%... or U.S. 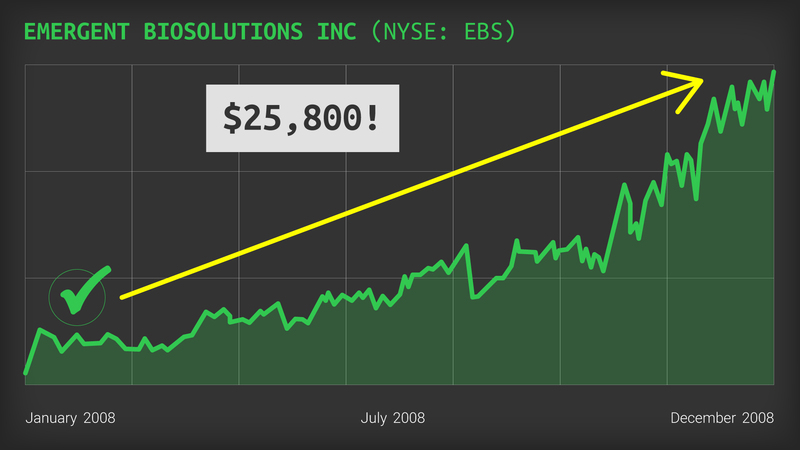 Concrete, up 2,821%... or Ambow Education Holding, which went up a mind-blowing 7,353%. Any of those stocks could do it on their own. But the small gains along the way can help just as much. And let’s face it, not every pick will be a winner – all investing carries risk. But I think Alex’s track record speaks for itself. For example, we just saw a handful of the 37 triple-digit winners Alex has produced in the last three years. 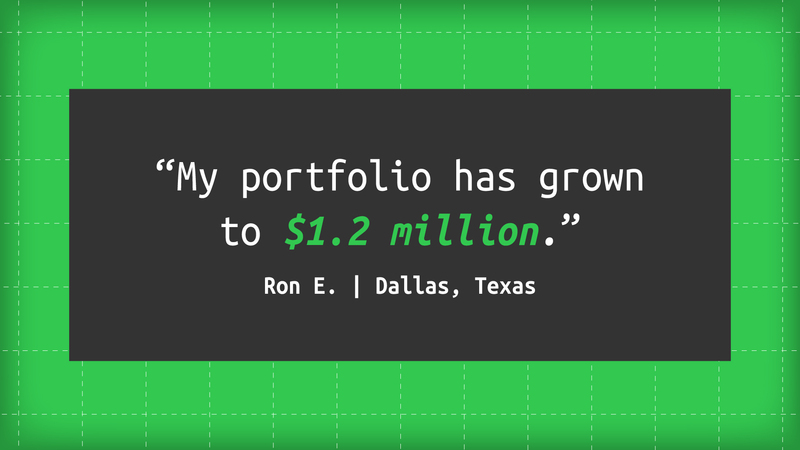 If you’d put $5,000 into the smallest (Swift Transportation, 110%) and rolled your winnings over, it would’ve taken you just four quick trades to double your portfolio. But this clearly shows the full potential of Alex’s strategy. It’s Alex’s favorite play trading below its true value right now. And more than enough to fulfill the “double your portfolio” promise. Question: Do I need to watch my computer screen all day? Answer: No! 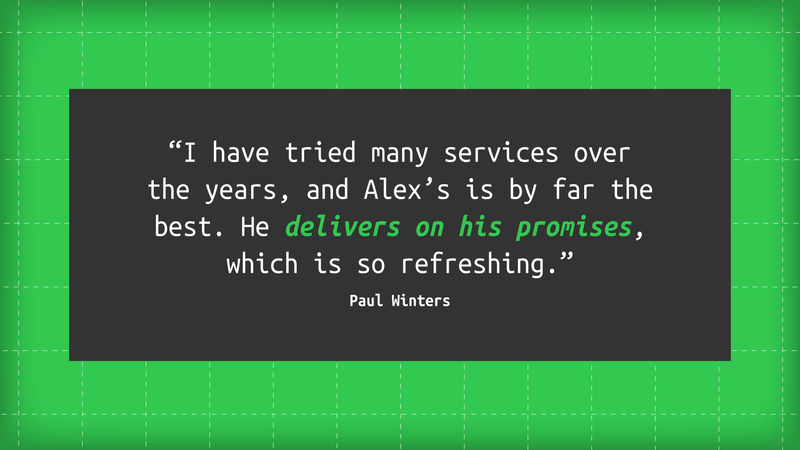 Alex and his system do all the hard work for you. He’ll watch the screen all day so you don’t have to. He’ll do his own research on each company that gives him a GREEN CHECK MARK. And every other week, he’ll send you an alert with a new trade recommendation. OK, one last question: Is this system only for traditional stock trading? Answer: Not at all... with most recommendations Alex sends, he’ll include both the stock and the options play. If you prefer to buy only stocks, that’s completely fine. And I have no doubt you’ll do quite well. But in order to see the really big gains, I suggest you try out the special plays as well. They can boost your profits dramatically. But you could boost your returns as much as 73X with the special plays Alex recommends. Even better, these special plays can put profits in your pocket much faster than standard trades. And 64 days: 493% on Apple. Even if you’ve never traded options before... Alex’s got very easy instructions on how to execute these special plays. This report is easily worth a hundred dollars or more, but it’s yours FREE when you sign up. How or if you trade them is completely up to you! So how do you get started right now? And you’ll be one step closer to doubling your portfolio in the next year! It’s yours FREE as a thank-you for joining The True Value Alert. We can accept only 500 people today in total. In today’s world, it’s the first movers who make the most money. So we’d hate for you to miss an alert or update from Alex. And so you’ve always got access when you need it most. This little device is incredibly handy, and we’re giving it to the first 250 people to join. Hot Recommendations: An average of twice a month, Alex will send you a heavily researched recommendation. He’ll include his analysis and everything you need to know to put you on track to double your portfolio in the next year. Free Best-Selling Book: Alex will send you a copy of his game-changing best-seller The Gone Fishin’ Portfolio. Urgent Trade Alerts: When it’s time to take any profits, we’ll send you an email with simple instructions on how to collect. Model Portfolio Updates: We’ll regularly alert you to any important changes in our positions, including what action to take when appropriate. 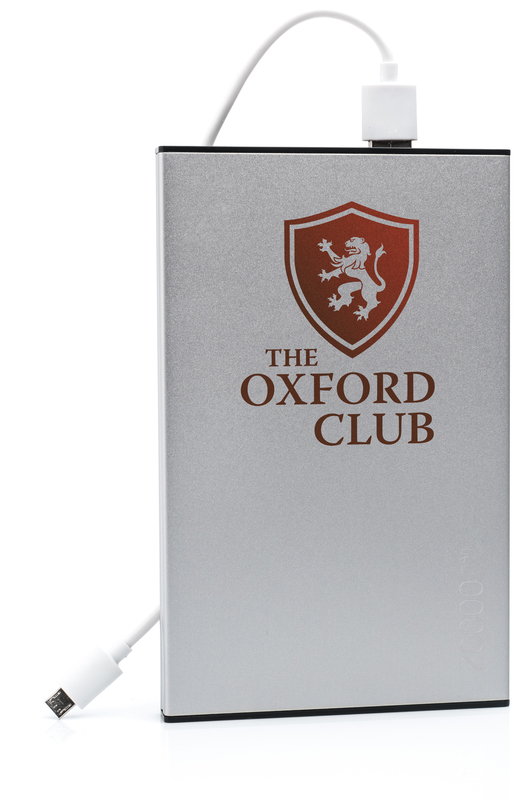 FREE GIFT: The first 250 to respond today will get a FREE Oxford Club phone power bank, to ensure you never miss an important alert. Remember, we can accept only 500 people total into the service today. This will ensure you can always get into recommendations at the best price. And you’ll have to pay a small percentage of what big investors pay for the same kind of information. The price for Alex’s True Value Alert service is just $4,000. Why such a great price? Alex insisted on a low, low cost that would allow almost anyone access. As I mentioned earlier, he could be living on a remote beach somewhere, sipping margaritas. But that’s not who he is. 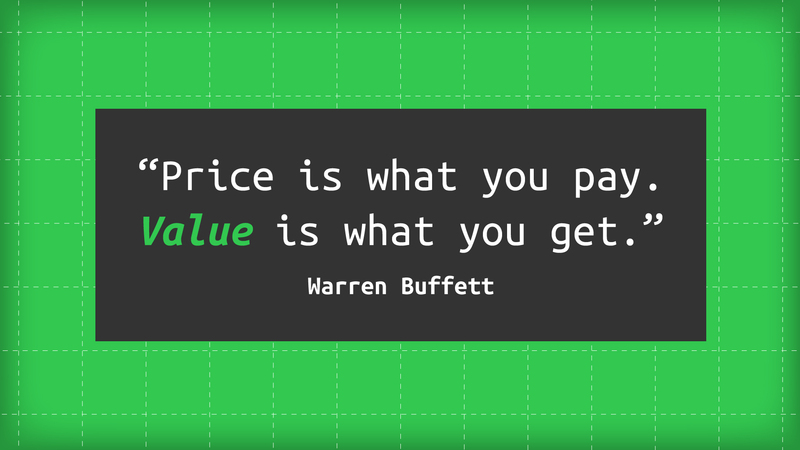 Which is why he’d like to welcome you into The True Value Alert today. And the Ultimate Value System uncovers these types of opportunities all year long! That’s why we’re confident you’ll see how to double your retirement portfolio in the next year... using just 5% of your portfolio. 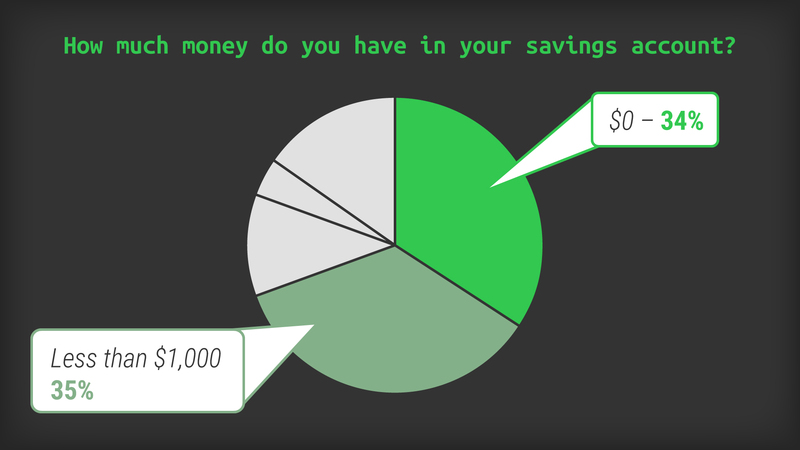 As you’ve seen over and over, just $5,000 could take a $100,000 nest egg to more than $200,000. Imagine... all that opportunity for the price of $4,000. Basically, if you aren’t completely satisfied... call us up and we’ll cover the cost of another year to make it right. We can make this guarantee only because we’re so confident in the performance of the Ultimate Value System. 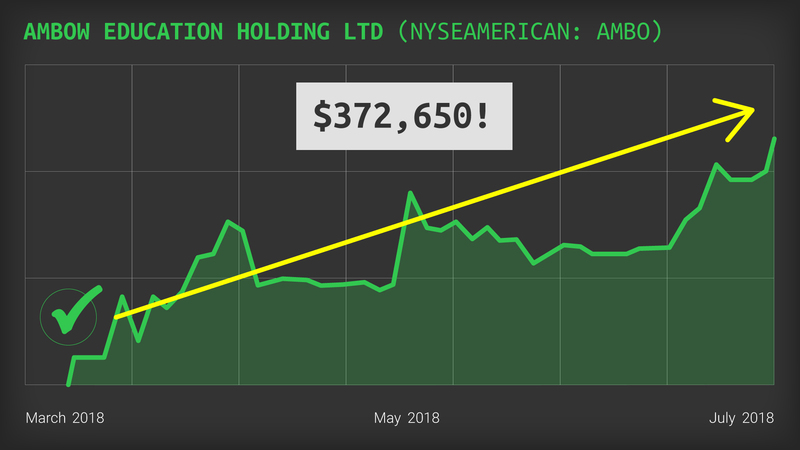 Even $73,530 on Ambow Education Holding. And I’ve dropped the price by $2,050! On top of all that, we’re giving you a special guarantee to make absolutely sure you get the chance at life-changing profits. So now it’s time to make a decision. In the next couple of minutes, you can lock yourself in as one of only 500 new subscribers Alex is accepting today. And once we hit 500, we won’t be able to accept any more subscribers. Alex prefers to keep the group small so everyone can get into his recommendations at the best possible prices. So you need to act now to ensure you get in. Remember, Alex has spent five years working to perfect this system. And we estimate another $1 million will be spent annually just to maintain it. Quite honestly, we can’t risk giving out our secrets for free. That’s why we can’t offer any refunds. Now, I’ve done this long enough to know that the moment I say “No refunds,” the tire kickers or folks looking to score some free research will tune out. And those people know that there’s no such thing as a free lunch. This service is not for you. You need to click the button below and subscribe now! Clicking the button doesn’t obligate you to anything just yet. You’ll be taken to a secure order form where you’ll have the chance to review everything before you make a decision. Remember, Alex’s Ultimate Value System is flashing a big GREEN CHECK MARK on several stocks right now! Meaning you could be collecting your first big fat payout in the next few days. Imagine grabbing a big win like 200%, 400% or even 600%... then getting a new opportunity every month, over and over with no expiration! It’s why we’re guaranteeing you’ll have the chance to double your nest egg in the next year, starting with just 5% of your portfolio. That’s the power of Alex’s True Value Alert. Simply click the “Subscribe Now” button to get started. From Alex and me, thank you for your time.